Pattern Description: The painted high relief scene includes a photographer, a camel and rider, and buildings in Rochester NY. At the top of the stem are 3 scimitars going up to the bowl. 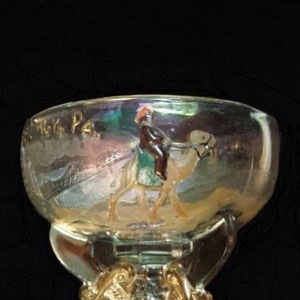 The raised, painted pattern around this glass is made up of scenes of a photographer, a camel rider, buildings in Rochester, NY (the location of the convention for 1911). 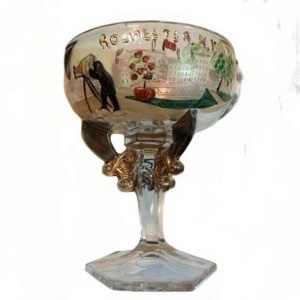 These commemorative pieces were commissioned by the Shriners organization. 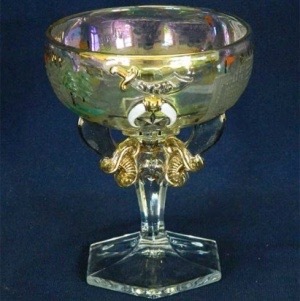 The base is 6 sided with 3 scimitars holding up the bowl of the champagne. 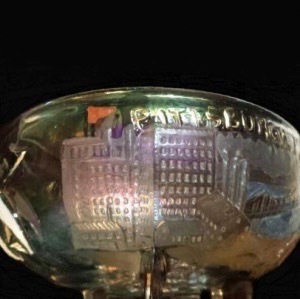 It stands about 4 3/4″ tall and is about 3 3/4″ wide.